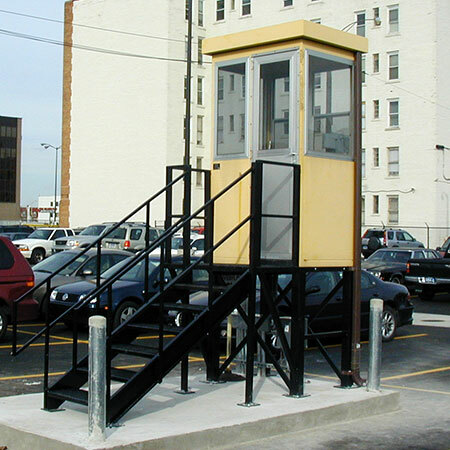 Little Buildings get you above vehicles and other site line blockages so you can oversee parking lots or other secured areas. 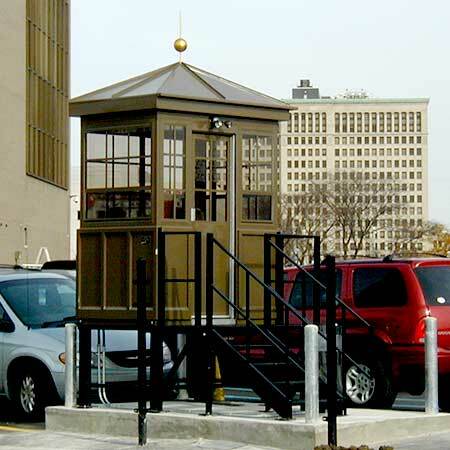 Your Guard Shack with Stand or parking booth with stand can be ordered with elevations of 1' up to 8'- you choose based on your needs! What do I get? 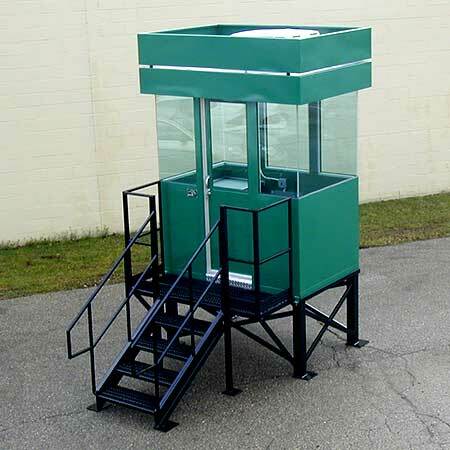 Here's what you get with your standard Elevated Guard Shack , Stand Mounted guard house or Elevated Parking Booth from Little Buildings, Inc: Welded galvanized steel construction, tread plate steel floor, clear tempered safety glass windows,built-in work counter with storage drawer, insulated walls, floor, and ceiling, sliding aluminum door with glazing, aluminum threshold, weatherstripping, and overhead track with heavy duty ball bearing hangers. Lock is maximum security laminated hookbolt with interior thumb turn and exterior removable key cylinder. Are all little buildings the same? Not all manufacturers offer this quality material and standard features in their stand mounted elevated guard house. You may find a slightly cheaper price, but you will not be as satisfied as you will with a new Guard House with Platform from us. Make sure your purchase is one that everyone will be happy with. At Little Buildings, the quality is built into your new Elevated Guard House before the name tag goes on! The Stand itself features galvanized steel Grip Strut open tread steps and porch helping to provide improved footing in most weather, tube hand rails on steps and porch, anchor pads with bolt holes, toe guard, and black enamel finish paint. Stand and steps are shipped unattached from the Elevated Guard House. No on site work by Little Buildings, site work must be by others and is not included. The stand must be properly anchored to your concrete foundation before bolting your new guard shack Stand mounted on top. Mounting bolts to secure the elevated guard house to the stand are included. Include roll-down Mylar sun shades, dimmable interior lights, exterior floodlights, strobe light and warning sirens, anti fatigue mat flooring, surge protected outlets for sensitive equipment, tinted and insulated glazing. Each Little Building starts from scratch so we can easily change the elevated guard booth floor plan, door location, blank out windows, etc. 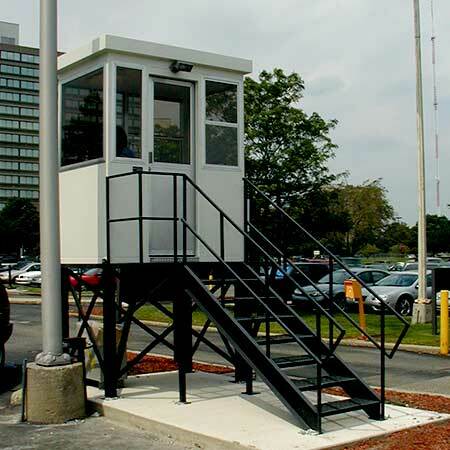 Other raised guard house options include CCTV mounting racks, empty conduit runs for communication and gate controls, wall or roof mounted air conditioners. Need additional features? Choose from a number of standard and custom items including enclosed frame with access door, larger porch area, or contact us and tell us what you want. You can also see additional options on our options page. At Little Buildings, Inc, we aim to please! Optional features may be shown in pictures. Shop drawings will be provided for approval after order received. Little Buildings reserves the right to make changes and improvements without notice.